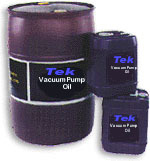 Tek-V is super refined and distilled hydrocarbon mechanical vacuum pump fluid. It is clear, colorless and odorless. It is designed for small to medium size direct drive vane pumps in high vacuum applications. It has excellent vapor pressure and chemical / temperature stability which make it suitable for a variety of applications. Will last 2 to 3 times longer than general purpose fluids. 55 gallon drum. Weight 425lbs.